What we need for the January 15 giveaway! It’s almost giveaway time again! We know what you’re thinking: “Wait. What?? Didn’t y’all just…?” Yep, the December giveaway was just 10 days ago. Now that we’re back on our regularly scheduled 3rd weekend, we have one less week between giveaways than usual. ATXHAW received an amazing amount of donations in December — 7,259 items! The only things that we are completely out of are notepads and men’s underwear. Men’s underwear is undoubtedly our hottest giveaway item; we run out nearly every month, usually before the giveaway is over. 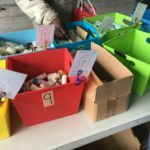 There are also quite a few items that we have a few of, but not enough for a full giveaway, such as hand sanitizer, nail clippers, shampoo, tissues, hand warmers, and emergency blankets. For a full list of what we need the most for Jan. 15th, please see the green light section on our What Do We Need? page. 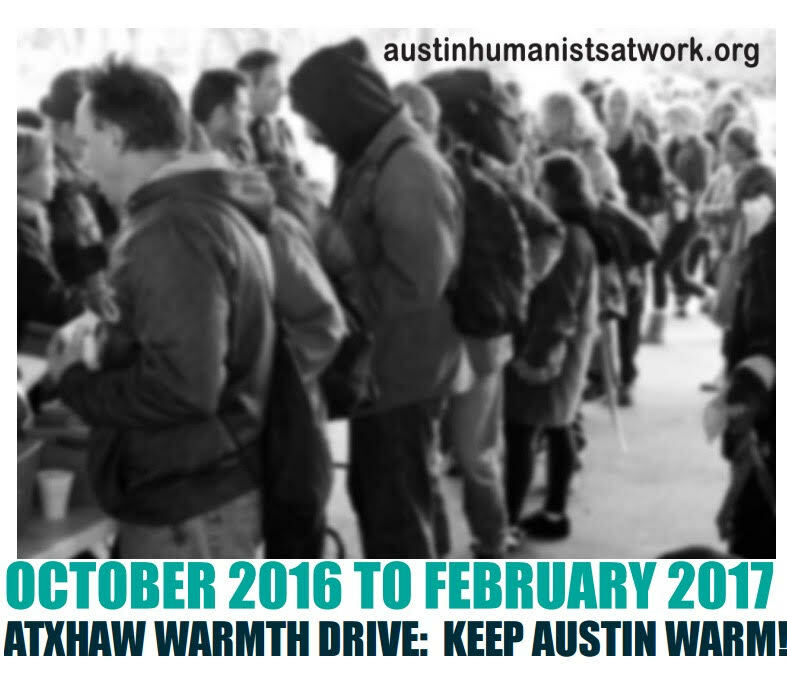 If you are in the Austin area and would like to make a donation, please contact our donations coordinator for pick up arrangements at donations@austinhumanistsatwork.org. 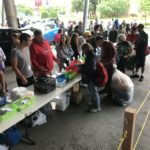 We have volunteers all around the Austin area that will be happy to pick up your items. You can also bring your donation to the giveaway! We ask that you bring a list of what you’re donating with your name and email address, so that we can log your donation quickly and accurately. We will NOT share your info with anyone. 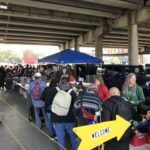 If you’re not in the Austin area and would like to easily purchase and send donations, please visit our Amazon wish list. Your donation will be shipped directly to us. Do you have a jacket from last winter that just doesn’t fit anymore? Maybe an extra pair of gloves? 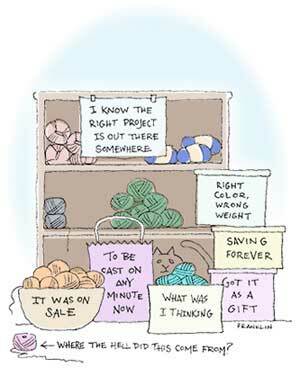 Or a cozy knit hat? Those extras could make a big difference to someone experiencing homelessness! Donate them today and they will be handed out to someone in need at the January giveaway. If your neighborhood association or local business has a community bulletin board, post a Warmth Drive flier! These handy PDFs are also perfect to attach to an email. Our friends at St. Andrew’s Presbyterian Church are looking for volunteers to help when the church serves as a cold weather shelter. You may be wondering, “What’s a cold weather shelter? How is it different from the shelters that are open every night?” The cold weather shelter system is activated by Front Steps when the temperature dips to or below 32°, or when the temperature is at or below 35° and there is high winds and/or rain. Those who need shelter from the biting cold go to ARCH at 500 E. 7th Street. After a lottery to determine sleeping arrangements, some are transported to off-site shelters that open for this purpose, such as recreation centers and churches. That’s where St. Andrew’s comes in. Individuals staying at St. Andrew’s can expect a warm dinner, the option to take a shower, and a safe place to rest for the night. That’s where you come in! St. Andrew’s needs volunteers to help with dinner (6 p.m. to 9 p.m.) and to stay overnight (9 p.m. to 7 a.m.). If you’re interested, please contact Ed Kopas at edwardkopas@yahoo.com or 512-659-9880. Do you have the right yarn, but not the right project? Put that extra acrylic or wool to good use by making a soft hat, warm mittens, or a cozy scarf for someone in need. If you’ve got cotton yarn, make a durable washcloth. 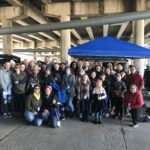 If you’d like to meet some super cool knitters and crocheters, join the ATXHAW Gettin’ Knotty Group at their next meetup! This month’s meetup will be on Thursday, January 12, in the cafe area of Barnes & Noble (Arboretum location) from 7 to 10 p.m.
We hope you are staying warm and avoiding the cedar pollen! Have a great week. See you on the 15th!